Inspired by Jonathan, a good friend of mine, he’s 9 years old. He loves music. You fall in love with him at the first sight. He’s full of life. Born to a mum with horrific Genocide traumas, shortly after Jo’s birth his mother developed severe mental health difficulties. Jo remained in the care of his mum in spite of the living conditions. Due to extreme conditions of living, part of Jo’s brain was severely damaged before it could develop. 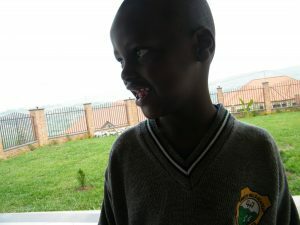 Unlike so many children in Rwanda born in the same conditions, Jo was fortunate, rescued by his Auntie at the age of 4 after she returned from abroad to look for her displaced family by the Genocide, Jo was found unable to walk, speak and nearly loosing his vision. Today Jonatan is nearly 10 years with severe learning difficulties, unable to speak and restricted in mobility but hopeful, optimistic and ambitious. With the right healthcare, the right support and education Jonatan could become a fully functioning member of the society and have a real positive contribution to his community. To provide care, support and facilities to children with mental health problems and learning difficulties in Rwanda and Uganda ( East Africa). They must be remembered and cared for. They should be loved, trusted, understood, valued and kept safe so that they are interested in life and have opportunities to enjoy themselves, be hopeful and optimistic. They should be able to learn and have opportunities to succeed, accept who they are and recognise what they are good at. They should be supported to have the strength to cope with life challenges (resilience) and the ability to solve problems. Support our Foundation and be part of a generation with unlimited possibilities and unlimited opportunities for all.